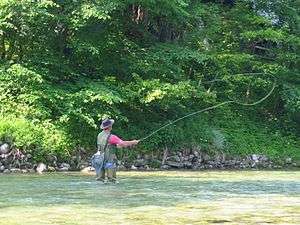 This article is about the emerger. For the hockey player, see Rob Klinkhammer. The Klinkhammer is a popular Emerger used in fly fishing to catch grayling and trout. It is most popular within Europe, but has a growing interest in North America. The Klinkhamer, originally named LT Caddis (light tan), now officially named Klinkhåmer Special, was devised by a Dutch angler Hans van Klinken, in the early 80's to imitate an emerging caddis fly to catch grayling and trout which feed from them as they float in the surface film. This pattern has proven to be an extremely effective fly. In all variations of this fly, the abdomen of the fly float is underneath the surface of the water to attract the fish and improve hookups, while the parachute hackle and foam or wing is on or above the surface of the water for visibility and floatation.